Since buying C an Xbox for her birthday, I’ve spent a lot more time in the computer room playing on my Xbox Elite than playing in the front room on limited edition Halo Reach Xbox, on the 52″ TV, connected to the TrueHD 7.1 Amp. To be honest, I actually prefer it, as we’re being a more sociable with each other. In the past, I would normally spend a good couple of hour playing on the Xbox downstairs, and C would lose hours on a “Dinner Dash type” time management game. In the computer room we both have an LG LED 23″ FullHD Monitor/TV which we have the Xboxs connected to, which we then use as a 2nd monitor. The LED TV’s are great and give a great picture, however the sound quality is only average at best. I’ve spend the last week or so with a pair of £10 Sony headphones on, which does give a lot better sound, but….I do miss the surround sound. Now we have the history out of the way, you now know why I’ve been out and bought this headset. As I mentioned above, I tend to spend more time in the computer room being “sociable”, but miss the surround sound. 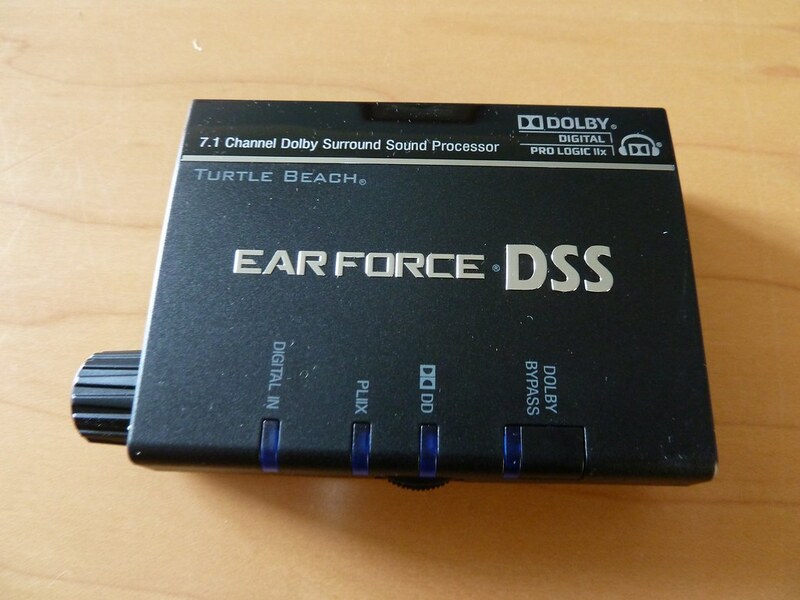 I knew there were headsets out there that could product a surround sound experience, as this type of stereo expander has been mainstream for quite a while. 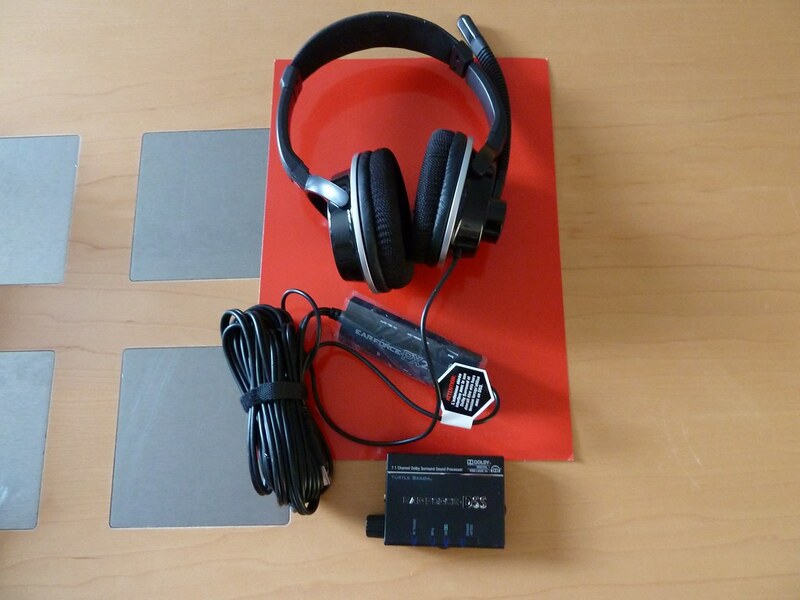 I did look as some headphone which actually had multiple speakers in each earphone which would give an actual surround sound, however these are advertised as being able to give a true 7.1 using only a stereo headset….obviously I was intrigued and bought them. 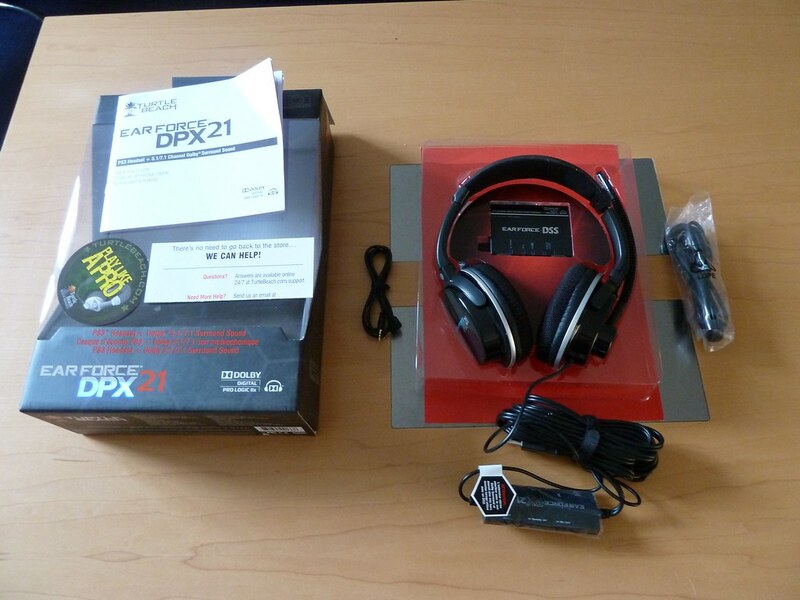 The DPX21 is essentially a bundle. 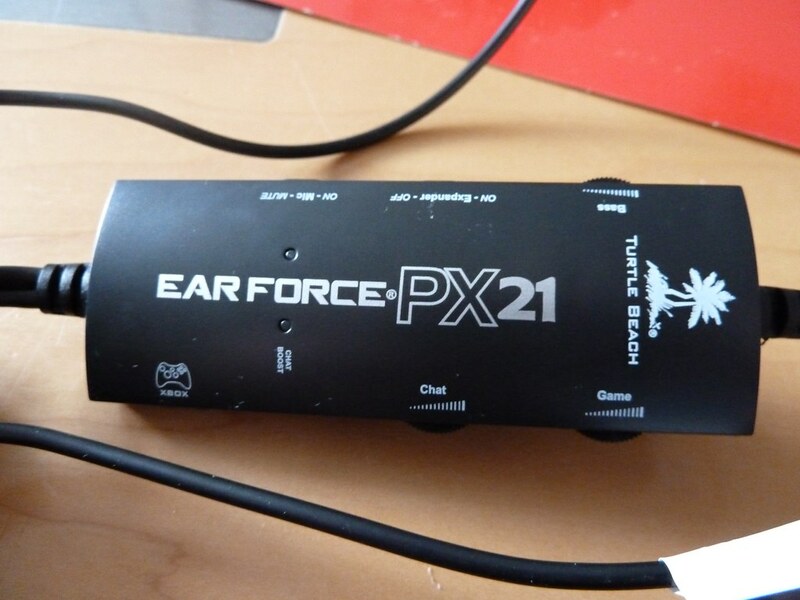 It’s the Ear Force PX21 headet, with the Ear Force DSS digital processor. The processor itself has an optical input, which then passed 7.1 / 5.1 to the headset giving you the 7.1 surround sound experience. Now to be honest, I was a little dubious, as everything in my head suggests, that stereo headphones and and will only produce a stereo sound ….surly ?…….I wrong was I !!! These things are AMAZING !!! Once I’d got everything wired up (which was slightly messy to be honest), I fired up Red Dead Redemption on the Xbox and was totally blown away the the ambiance. I then fired off a couple of shots, and just sat there with the biggest smile on my face. I have to say, that my expensive amp and 7.1 speaker system in the front room has been equalled if not beaten by this £100 headset ! I then plugged these into the PS3 and put on the Black Hawk Down bluray (my Bluray of choice when testing an audio system), and again… AMAZING ! The headset itself is very comfy, it is a little weighty, but the head strap is adjustable enough to take the weight. 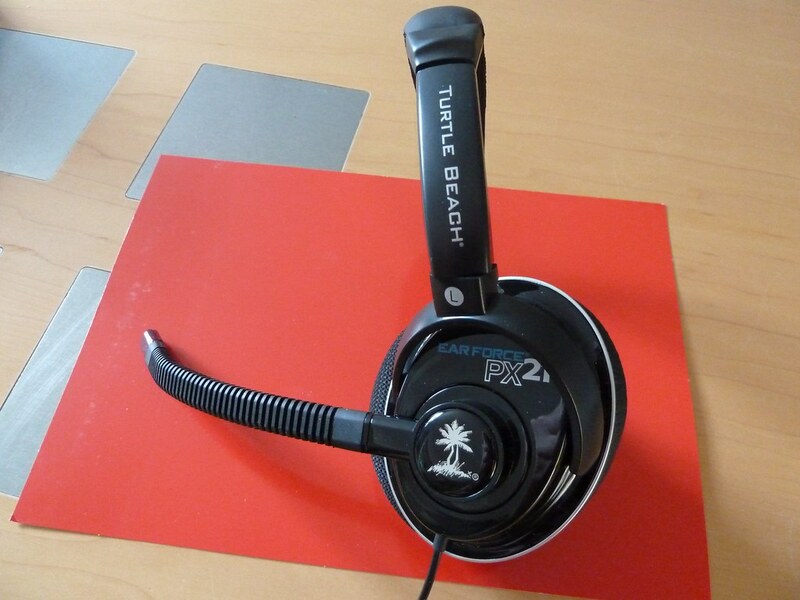 All in all, this is an amazing headset, and suggest to anybody who is playing games on a Xbox, PS3 or even PC/Mac in 2 channels due to not having room to place the speakers….and have a £100 spare, go buy theses, they are amazing ! I found these at Amazon for about £110, however with shopping around I found them at just over £90 at shopto.net with free shipping. 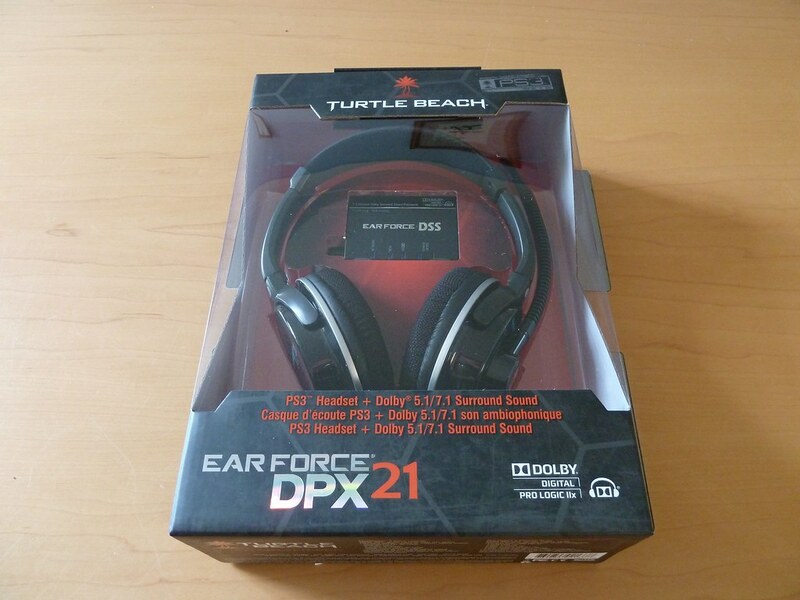 As always, unboxing photos below, as well as the official blurb from Turtle Beach describing how these work. I like most of you, use twitter, facebook and occasionally pop on to myspace to see how many bands want to be my friends. Anyway, on the 4th of October, through total fluke read through a twitter conversation, and noticed a load of twitter entries from @squ1r3ll, with updates on his gaming status….linking to a site called raptr.com. Being a bit of a gamer I’ve tried for months to get my gamertags, achievement, out to my friends and virtual friends, but the only way I’ve found to do this is manually. I tried a number of facebook apps, and had varied success, they would either change my status to “Darren is playing…..” after a couple of hours of gaming, or just not bother at all. The achievements would post to my feed, however this was a manual process, I belevie the app is called “Xbox 360 Live GamerCard”. Anyway, raptr.com, what is it…well let me tell you, it’s fantastic, and what I’ve been looking for, for ages. You sign up (using Facebook connect if you like) and add your gamer profiles, eg Xbox Live, PSN, Steam, Warcraft, etc etc, what it then does is monitors and reports on your gaming activities, eg which game your playing, on which platform, and records how long, and any achievement you may get. Xbox live is monitored through the feed that Microsoft so kindly provide, and updates almost in real time (can be a 5/10 min delay), PSN tracking is currently broken due to Sony putting a restriction on their data. Everything else is tracked by the client. The client is a custom messenger type client that can also run your msn, gtalk, aim, yahoo, xfire and icq, however this is the key to tracking the stats on your PC/Mac. On initial install it will scan your hard drive for games, and add them to your collection (both on the client, and on the website), any new games installed it will pick them up and also add to your collection. When your ready to play a game, just start as normal and this will change your messenger stats to “Darren is playing xxxxxxx”, as it does with your online raptr status too, and logs the time played. When finished, it calculates the time you were playing and adds this to your tally on the website. With the site you also get the option of a couple of signatures with varied information, all updating in real time, varying from currently playing to, the last/most played with you longest played 6 games. Once you start to build up your friends, it will give you a ranking out of your current friend on a particular game (bases on the number of achievements you have), you can also compare achievements on a game with upto 3 friends at a time. Finally one very cool feature of Raptr, is that when you get an achievement, it will tell you what percentage of Raptr users who have that game, have gained that achievement, giving you an idea of how hard it was. The only downside with Raptr, is that it is unable to check your PSN stats, now this is through no fault of their own, it just seems Sony is being a little protective about their data. You can update your playing time, but this is manual, hopefully some day in the future, they will allow this. From googling the PSN issue, I stumbled on a number of other social networking for gamer sites, GamerDNA, Playfire and Giantbomb. I haven’t used any of the sites as much as I’ve used Raptr, however they all seem to be kinda tracking my stats. Playfire, Love the layout, but again doesn’t pull through the PSN stats/trophies, doesn’t track time, and also about a day behind. GiantBomb, I only signed up for this last night, but it’s already tracking my Steam, Warcraft and XBL, but again, no PSN. All in all, it’s good to more and more of these sites popping up, I remember the day when gaming was deemed as geeky, however seems every man and his dog is doing it now, and it’s now socially accepted. This weekend’s offer on Steam, is the full game at £7.49 (Half Price), so decided to get a copy. To be honest, I am a big fan of FPS’s (First Person Shooters), however I’m more of a UT (Unreal Tournament) type guy, who love running around with the flack cannon, and rocket launcher and turning my opponents into a mess on the floor. I was very surprised at this game, it is very tactical, and you have the think instead of go running in with all guns blazing. I’ve only played it for a couple of hours, but thoroughly enjoyed it so far, can’t wait to go running through in co-op mode with any of my mates who has it. The graphics do look good, the AI is pretty intelligent (apart from the odd occasion where my team mates seem to get stuck behind walls, and objects). One thing I can’t seem to suss out is….I keep seeing achievements pop up on the screen, but have no idea where to find them, they don’t seem to be on Steam ? If anybody know, please drop me a reply, Thanks in Advance.